Nick Park and Aardman Animations’ latest epic, out on Blu-ray and DVD, is set in a prehistoric world of cavemen, rabbits and mammoths. For good measure it also throws in dastardly Frenchmen and football. Park coaxes great voice performances out of his all-star cast, while physical animation is in the capable hands of Will Becher (who directed the Creature Comforts TV series) and Merlin Crossingham (Creative Director for Wallace and Gromit since 2009). At one point a mallard appears in the distance. A caveman hurls a small rock at it. The rock travels an awful long way. Much farther than we expected. Eventually it reaches the mallard, revealed as a gargantuan beast on the scale of a dinosaur. The giant mallard charges towards us and the hapless tribe of cavemen. This is very much in the spirit of Early Man’s opening sequence wherein volcanoes belch fire and a carnivorous ceratosaurus does battle with a herbivorous triceratops clearly modelled on their counterparts in Ray Harryhausen’s One Million Years B.C. (1966). Harryhausen made a career out of inserting memorable monsters and other creatures into a series of extraordinary, otherwise live-action fantasy and mythological movies via camera trickery and special effects. Park describes him as “the King of Stop-Frame Animation” and acknowledges him here by naming one dinosaur Ray and the other Harry in the end credits. Not that Ray and Harry get long on the screen. As an asteroid hurtles through the skies, both cavemen and duelling dinosaurs pause. Its impact causes mayhem. Dinosaur feet stick out of the ground. In the resultant crater first one prehistoric man then another picks up a red hot, glowing ball and throws it away in pain to much laughter from their peers. Another kicks it, moving it between his feet to keep its searing heat at bay. Soon, men are dribbling the ball across a flame-disgorging chasm towards a goal made up of three rock slabs Stonehenge style. Thus, football has been invented, a fact recorded visually on a nearby rock face by a primitive artist. The gentle sense of whimsy pervading all this is the stock-in-trade of Bristol-based Aardman Animations. Peter Lord and David Sproxton’s company began in the 1970s by creating animated plasticine man Morph for the BBC. The studio subsequently proved the perfect artistic home for Park and his creations Wallace and Gromit. Feature films followed. Park co-directed both The Great Escape parody Chicken Run (2000) and Wallace and Gromit vehicle The Curse Of The Were-Rabbit (2005) while other Aardman features have included Peter Lord’s The Pirates! In an Adventure with Scientists! (2012). All these films owe much to the brand of British humour espoused by legendary comic The Beano in cartoon strips such as The Bash Street Kids, which featured an unruly group of school children at constant loggerheads with their long-suffering teacher. Somehow the conflict was always good-humoured, never vindictive or nasty. Perhaps the roots for this sensibility can be found even further back in British film history in the Ealing Comedies of the late nineteen forties and early fifties. 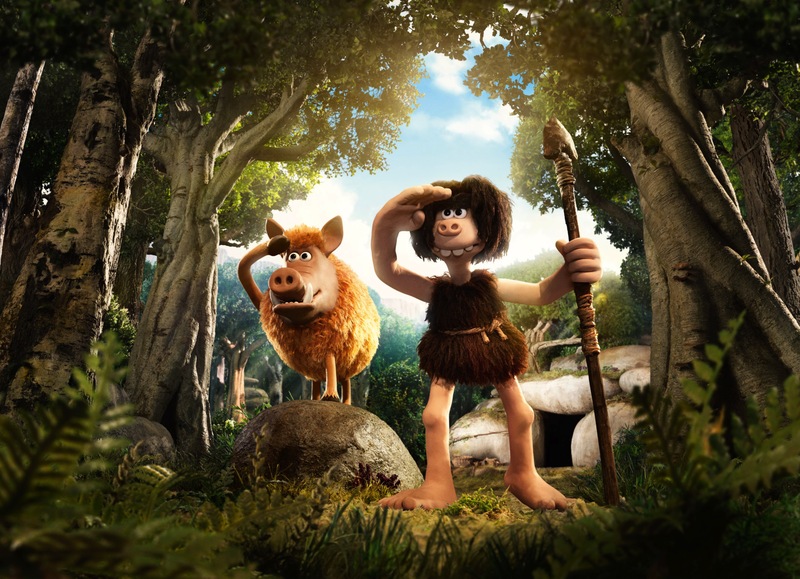 Once Early Man’s prehistoric preamble is over, the narrative jumps forward “several ages” to a valley in the crater caused by the meteor and a plot concerning a prehistoric British tribe led by their chief Bobnar (voiced by Tim Spall) who wants nothing more than an idyllic existence hunting rabbits. And lie-ins. “Wake up chief”, says the early-to-rise Dug (voiced by Eddie Redmayne) as Bobnar attempts to sleep in, “you’re early man!” Just as Bobnar’s lie-in is shattered by Dug, so too his bigger dream of an easy life is shattered by the arrival of Frenchmen bearing Bronze Age technology – armour, machines and so forth – who set up a town nearby. By virtue of some strange twists and turns of plot, Dug finds himself in Bronze Age Town where he learns the townsfolk are obsessed with soccer and flock regularly to see the local team Real Bronzio in action. The games are free – sort of. “Voluntary contributions – everybody has to pay”, chants the man on the door. As with Chicken Run, it’s an outing wholly removed from the Wallace and Gromit franchise. There are undeniable similarities, however. Central caveman character Dug and pig sidekick Hognob (voiced with a series of noises and grunts by Park himself) are not a thousand miles away from dim Wallace and smart dog Gromit although, as the director has pointed out, Hognob is much more of a pet. However he’s still smart enough to act on his own initiative. Hooking up with Goona (Maisie Williams), a talented footballer prevented from playing professionally because she’s the wrong gender, Dug cuts a deal with Lord Nooth (Tom Hiddleston). If Dug’s tribe can beat Real Bronzio in a football match, Nooth must give them the valley back. There is an unfortunate downside though: if Dug’s side loses, they must spend the rest of their lives working in Lord Nooth’s bronze mines. So it’s up to Goona to coach the tribe into a side capable of taking on Real Bronzio and winning. Early Man is released on Blu-ray and DVD on 28th May 2018.